What does Vic Reeves and Bob Mortimer’s homage to Marvin Gaye and Otis Redding have to do with a visit to Hilbre Island? Hilbre Island stands at the head of the River Dee, it is the most westerly point of my Patch. Cut off from the mainland twice a day by the tide it is a great place for peace, quiet contemplation and wildlife photography. Arriving early on the island you can see the tide start to fill the channels that meander through the mudflats until the water spills out and floods the flats preventing escape back to civilisation. For a few precious hours you are disconnected from the real world. Then slowly the waters recede and seaweed covered rocks start to emerge from the brine until a refreshed, albeit slippery, route back to shore is discernable. Essentially, it is an opportunity to, amongst other things, forget everything and watch the tide come in, then go out again. It is also an opportunity to get close to some great wildlife and photograph/film it. So, as part of an ongoing project to record the natural history of this island, myself and my dad pack cameras, lenses, memory cards, batteries and plenty of food before heading over ahead of a rising tide. The plan was to set up a couple of time-lapse cameras, dad would film the wading birds feeding at the tide edge and I’d be grabbing a few stills of whatever came my way. 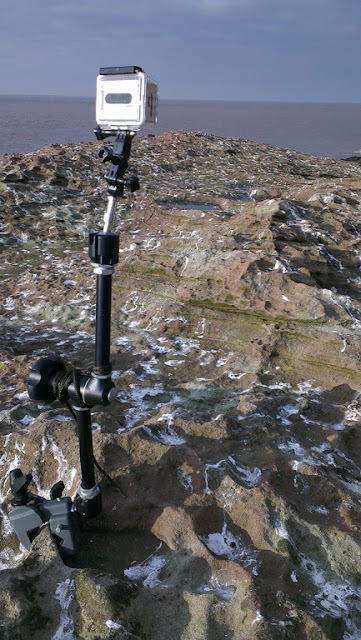 Pooh-spattered rocks give away the location of the Oystercatchers at high tide so a time lapse is set up there to watch the roost assemble. I drift around the rest of the island to see if there is anything to photograph. 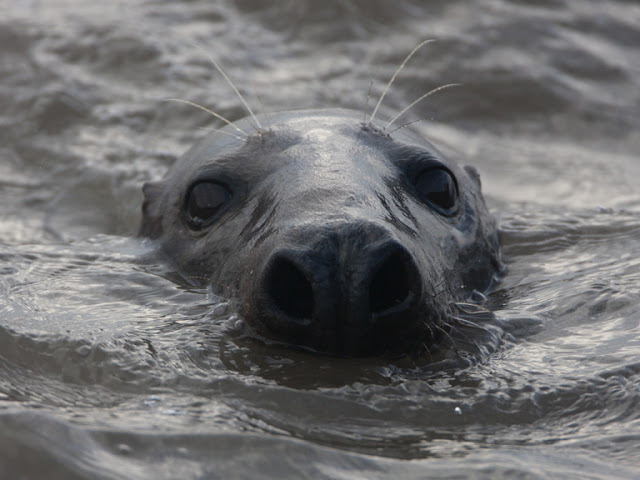 Grey Seals numbers are at their lowest at this time of year as the majority are off to even quieter spots to have their pups. Even so you are pretty much guaranteed to see a few close to shore especially if you are on the island over the tide. The light is truly terrible, a low overcast is darkening the day, the water is murky from the mud churned by the rushing tide and the seal’s fur is brown-black. This creates a rather dark and sinister image. 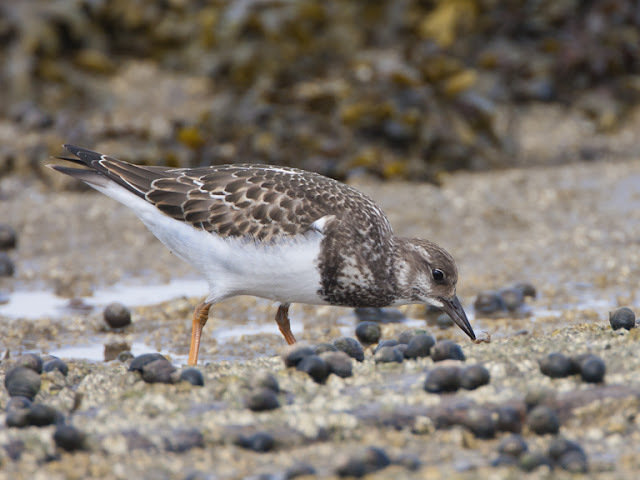 At the far end of the island by the lifeboat slip there are many Turnstones feeding. 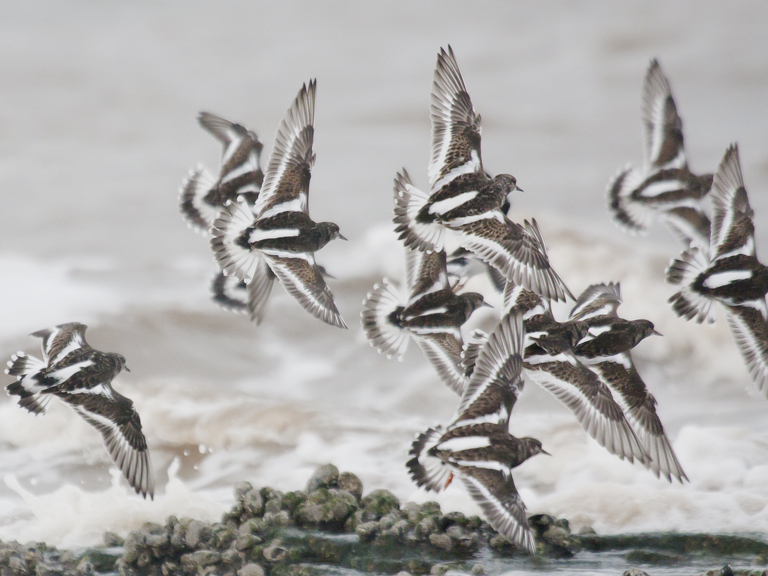 The tide will reach its maximum soon pushing birds from their feeding to roosting sites Tide disturbed individuals fly in from further round the island and land by the surf. Thoughts turn towards the Oystercatcher roost. It must be reaching a peak now so I amble down to where we deployed the time lapse. 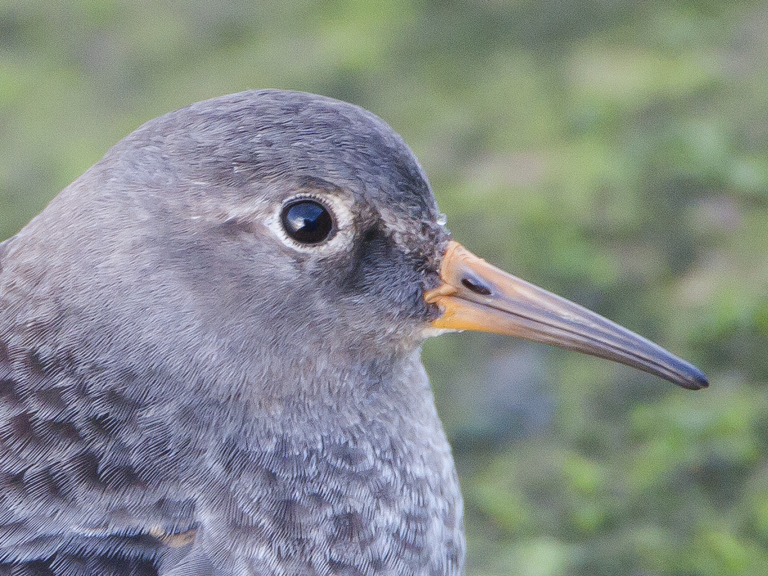 Rather pleasingly there are a few hundred birds right in front of the camera. It is always a bit of a guess when selecting the position of the unit. You can’t return and move it once it is in place if the birds are close but not in shot you’d disturb then and get no footage at all. I retreat and leave the Oycs to snooze on the rocks glad that we will have some images on the time-lapse sequence. The birds disappear from the roost in one go with quite some noise and bluster. In fact there is pandemonium throughout all the wading birds about the island. Distress and alarm calls ring out as small flocks and big flocks take to the air all around us. It sits gargoyle-like on the sandstone ramparts of fortress Hilbre looking, well, sinister, but in a different way to the Grey Seal had earlier. That had looked dark and foreboding, with an oddly human like fore head and eye sockets, but a doglike nose and mouth. Almost like a creature from a painting by Hieronymus Bosch. This raptor is all hooked bill and sharp claw, speed and ruthlessness. It sits for a while then drops low over the west of the island turns south and leaves, panic rippling in its wake. After a while the birds settle down again and the peace I love these islands for returns. I wander down to the far end of the island and climb the cliffs to the left of the seawatching hide. I edge out to the furthest point of the rocks and peer out to sea. I’m watching the tide go out. Below and to my right, on the rocks being lapped by receding tide I notice a movement. 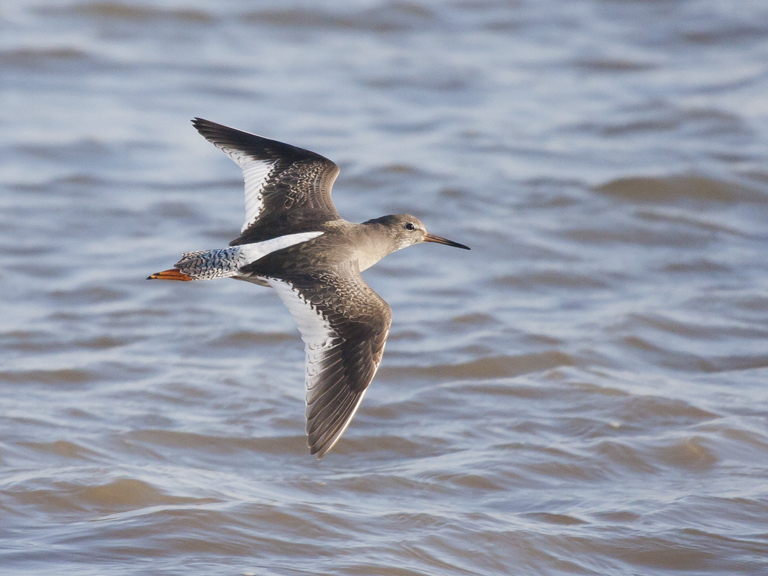 2 Purple sandpipers are stood together looking, much like I am, out to sea. They bob about and scuttle along the rocks when a big wave splashes. I have a different perspective on them from up here. My usual view would be one on their level as I try and sneak up on them for a picture or two. 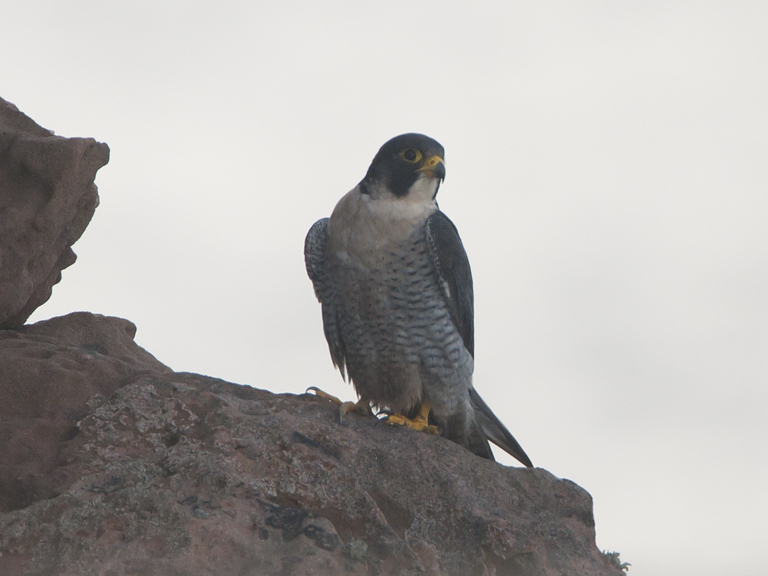 It is rather refreshing to look down on them from my craggy vantage point, with them oblivious to my presence. I get a few pictures then I just watch them for some time, see their interactions listen to the little ‘peep’ calls they make to each other. 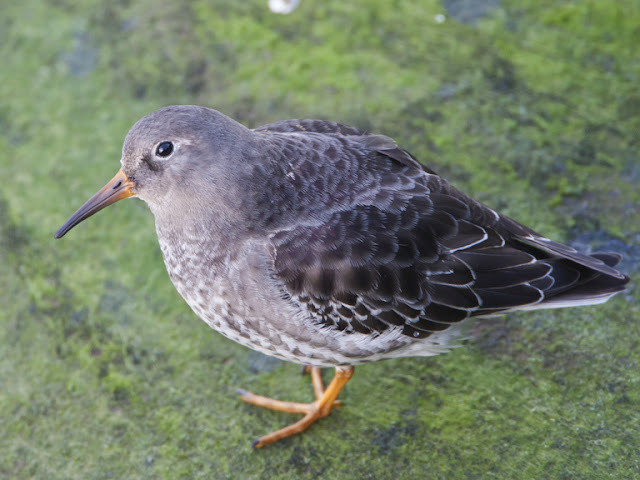 So now I’m thinking what do Purple sandpipers have to discuss? My mind rolls over this question and goes off in many directions some serious, some not. It isn’t long before the Purps are christened Otis and Marvin and the calls between them is the question posed by Vic and Bob at the top of this post. Eventually the Purps notice me and I think that they will flee. They don’t, instead they carry on with their conversation and keep looking out to sea. Every now and then they cast a quick glance in my direction. Every now and then I take a picture. Reviewing the pictures from my perch I can see myself reflected in their eye. I'm a little lump on the slopeing sandstone. I can see every detail of their feathers, the tones of orange on their beaks, even what look like tiny eyelashes around the mirror eyes. This island and its natural history is beguiling, beautiful and inspiring. As over emotional and as clichéd as it sounds I feel lucky to be here and hopeful that as a species we don’t mess it up for the wildlife we share it with. I feel part of this place and connected to these birds as we all sit and watch the tide coming in, and going out again.